Your time is valuable, and faster performance is essential. Carry out longer, fatigue-free pipetting with portable serological S1 pipette fillers with advanced speed controls. Pair with a wide range of serological pipettes in the size and packaging option that is right for you to stay productive in the lab. Thermo Scientific™ Nunc™ serological pipettes are accurate disposable plastic pipettes available in a range of sizes and packaging option (plastic/paper or plastic film). These pipettes have PET filter plug preventing cross contamination, have sterility assurance level (SAL) of 10-6, have bold & clear graduations and are certified pyrogen free. In addition, the colour coded packaging ensures ease in selecting the correct size. Portable and lightweight S1 pipette fillers provide longer fatigue-free pipetting with faster performance. Advanced speed controls, back-lit LCD display, and a lithium-ion battery means it's ready to use when you need it. Sterile, colour-coded Thermo Scientific LabServ serological pipettes are made from polystyrene, available in a volume range from 1 mL to 50 mL, individually wrapped with paper or plastic, are colour-coded and pyrogen free. Manufactured with the highest grade polystyrene for robustness and extreme break resistance. 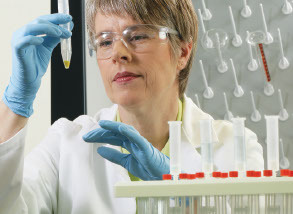 TPP serological pipettes offer large capacity volumes in a compact, ergonomic design.